This is the last post in a 4-part blog series on medical device root cause analysis. If you want to start at the beginning, read our first post on the basics. We’ve also combined all four posts into one easy-to-read PDF, plus added some extras. Download it here. One of the cute annoyances of 4-year-olds is their persistent inquisitive nature. Why can’t I have another piece of cake? Why do a I need to take a nap now? Why can’t I have Froot Loops for dinner? Following the seemingly innocent and inquisitive strategies of a 4-year-old can help you dig deeply into problems and overcome preconceived notions of what is going on. Why is the rework rate higher at the Texas facility than other facilities? The Texas facility assembly line workers are simply not as adept at assembly. Why are the Texas workers not as good? They have not been trained on updated assembly methods. Why hasn’t the Texas facility team received training? The Training and Development Manager works in the Florida headquarters and has not yet trained the Texas team. Why hasn’t the Training and Development Manager trained the Texas team? Senior management mandated a 20% reduction in travel costs last year, so the T&D Manager had to postpone the visit for several months in order to “batch” the assembly methods training with other training at that facility. See how digging deeper revealed one possible cause? This technique can work quite well on many problems, but you also need to know when to stop. If you go too deep, you may actually lose focus! Also, take care not to jump to conclusions. In this case, it would seem that the higher defect rate at the Texas facility was caused by a cut in the travel budget and lack of training, but those factors may only partially account for the higher defect rate – there may be other forces at work. Now that you have a list of probable causes, you need to narrow them down to the actual cause. This process of elimination must be verified with logic and fit the “footprint” of the symptoms. A theory about a cause will always have some hidden assumptions. Using the Texas facility example above, the assumption is that the problem is associated with lack of training. The theory is plausible, but you need more data to verify it. For instance, what is the expected “per piece” throughput of assembly line workers in Texas versus other facilities? How experienced and respected are the line supervisors in Texas versus other facilities? What set of parameters is the Texas facility using to approve products for release? You need to determine what data is needed to examine this in more detail. Sometimes the best way to verify a probable cause is to implement a remedy and observe the results. In this case, sending the T&D Manager to the Texas facility to train the employees might be a good first step, followed by careful measurements of the subsequent rejection rates in that facility. But use caution when using a trial-and-error approach to problem solving. Throwing money at a problem can be counterproductive and obviously expensive. You might be wrong. Coincidences: Just because it worked once does not mean it will work every time. The Hawthorne effect: People will often react positively to the mere fact that someone is finally taking action. The guinea pig fallacy: Do not assume that something that works on a small scale or in carefully controlled trials will still work when it is implemented across the board. Time to identify probable causes and prioritize them for verification: Recognize that finding the root cause may take some time, and time is usually a major resource that may not necessarily be available to the team. There are myriad ways you can plot your cause-and-effect data: scatter plot diagrams, Pareto charts, stratified frequency plots, “discrete C and continuous Y,” tree diagrams, and more. These tools can help you visualize the data so you can spot patterns that otherwise would be difficult to see just by looking at numbers. The human brain is wired for pictures, not data, so use this basic fact to your advantage! A manager in a call center of an insurance company wants to know why customers are complaining about the long time on they spend on hold. Using a histogram, the manager plots the data related to the last 150 calls placed to the call center. The result is presented below. 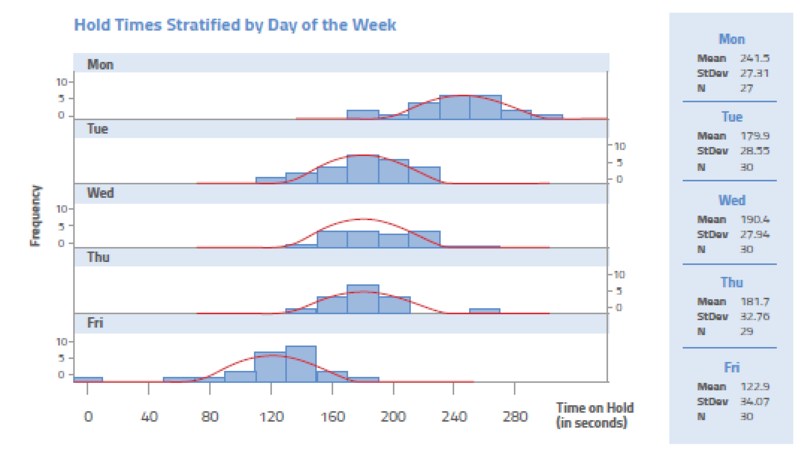 Interpreting the histogram, it is quite apparent that Monday is the worst day. But why? This will cause the manager to look at things such as volume of calls and staffing levels as the root cause journey continues. We have covered only part of what there is to learn about medical device root cause analysis. If you enjoyed this series of articles and want to take the next step in advancing your knowledge, consider Oriel STAT A MATRIX’s training class on root cause analysis. 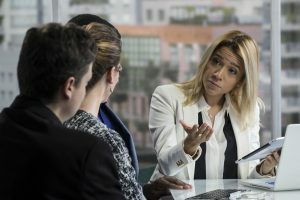 In it, we teach a methodology and the supporting techniques and procedures that make the root cause analysis process both effective and efficient.